William Marcy Tweed (or William Magear Tweed; byname "Boss Tweed"; 1823-1878), was a New York City Democratic Party leader who turned Tammany Hall into one of the most corrupt political machines in United States history, as well as running a network of close city officials under the so-called Tweed Ring, which was responsible for extorting kickbacks from contractors and others doing business with the city, manipulating the public vote in his favor, and plundering more than $100,000,000 from the treasury before he was driven from power and arrested. Tweed was born in New York City on April 3, 1823, the son of a chairmaker, from whom he eventually learned the trade. As a young man he became the organizer and foreman of a city fire-engine company, which gave him a bit of popularity and a taste of the power of local politics, from which he spent much of his life. He was a city alderman in 1852-1853, served one term in the United States Congress in 1853-1855, then returned to New York to serve in several successive posts before being elected to the state senate for one term in 1867. While serving as state senator he was also appointed to the department of public works in New York City as commissioner, and while in that position he gathered his three chief henchmen - Alexander Oakey Hall, Peter Sweeney and Richard Connolly - and with a few others formed the Tweed Ring. Their first order of business was to secure themselves in positions of power by bribery and influence among the lower classes in the city - already they had total control of Tammany Hall - which enabled them to manipulate and alter the outcome of the mayoral election of 1865. As a result, the mayor's office went to Hall; Sweeney was appointed the treasurer for both the city and county; Connolly was appointed the city comptroller; and Tweed the superintendent of streets. In 1870 these men would compel the city government to re-write the charter, enabling the Ring to install more of their cronies in selected positions; Tweed himself would be named commissioner of public works, which enabled Tweed to directly control the money flowing in. And the graft began: three hundred park benches were bought by Tweed for five dollars each, yet he charged the city $600 each to have them installed. On July 30, 1870, over $200,000 was charged to the city to repair furniture at several armories. To furnish a single courthouse, the city was forced to pay $1,476,980.24 to a single firm. In an article of the New York Times (January 3, 1871) it was identified that the Ring used their stolen money to purchase property in several city wards in excess of a million dollars between 1868 and 1871; Tweed alone was responsible for a total of $547,000; yet officially his salary was $2,500 a year. For several months in 1870-1871 various article speculated on the corruption alleged by Tweed, but an expose appeared in the New York Times on July 24, 1871, in which the writer laid bare to the public tens of millions of dollars that went missing. "We have brought very serious charges against Mayor Hall and Controller Connolly," began the article, "and in reply to them the Mayor says that the City owes us a bill for advertising which we cannot get." ("Proofs", July 24, 1871). Stating that the information came from a "dishonest person" was the Mayor's reply, but he did not deny the allegations. But worse was yet to come for the Ring, especially Tweed. Democratic reformist Samuel Tilden - who would lose a disputed presidential election to Rutherford B. Hayes - also threw himself into the fray and demanded investigations into the matter. But it was cartoonist Thomas Nast who did the most damage. 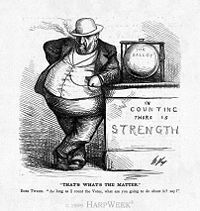 Cartoons appeared in Harper's Weekly showing Tweed as an uncaring buffoon about to alter the ballot box, or as a buzzard about to gorge on his victims. In one the blame for the stolen money was passed around the circle of his cronies without end. Tammany Hall was represented by a ravenous tiger, about to tear apart another taxpayer. Above all else, the cartoons were having an effect on the public, and on Tweed personally. "Let’s stop them damned pictures," Tweed supposedly said. "I don’t care so much what the papers write about — my constituents can’t read — but damn it, they can see pictures!" Tweed offered Nast a bribe of half a million dollars to stop his cartoons; Nast rejected the offer, and went on drawing. Tweed was arrested and charged with forgery and larceny in 1873, and he served two years. He then faced civil charges: a suit from New York for $6,000,000. Although technically in jail, he was allowed daily visits out to be with his family, and on one of these visits he escaped to Europe. The pleasure of living abroad was short-lived: he was arrested in Spain after a ship's hand recognized him from a Nast cartoon. Extradited back to New York, he died in prison on April 12, 1878. This page was last modified on 16 September 2016, at 17:03.